This past weekend, Michael Lo Presti, creator and organizer of the CT Trailmixers (among other things), hosted a fundraiser for Mental Health Connecticut that took the question we’ve been asking all year – “What Moves Wou?” – to a whole new level. 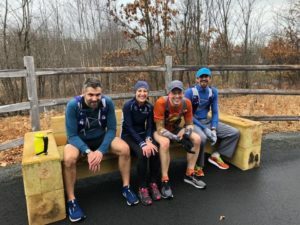 Michael and friends from his running circles decided to run 55+ miles across Connecticut to raise awareness of making wellness a priority and to raise funds for MHC. Michael’s first love is trail running but he also wanted to do a big run for this fundraiser. 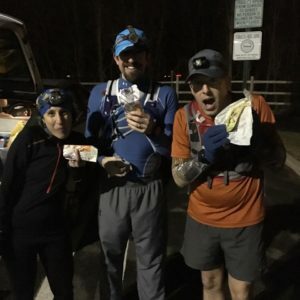 So, he found other runners who were interested in running rails-to-trails system, which isn’t exactly the woodsy trails that he loves so much, but it allows for a nice long run across our beautiful state and was a great way to connect with friends along the way. I once read that running is a selfish sport. You drain your wallet buying shoes and accessorizing with all types of gear. You spend hours each week on the roads or in the woods away from other commitments. You have a direct feed between your bank account and Ultrasignup. You race for the sole purpose of feeling good about yourself and boosting your ego. I disagree, although elements of this are true to a degree. Yes, much of running is a solo endeavor. Yes, it requires time away from family and work. And yes, people are inspired to run for many reasons: To stay fit. To boost confidence. To lose weight. I run to experience our beautiful planet – with its deep forests, winding roads, and snow-capped peaks – on foot. I run for the adventure of taking all day to move from point A to point B. I run for the bonds that form between me and my friends when we share our journeys together, whether it’s for three or fifty-three miles. I run for the joy and flow I feel when things click, my feet feel light, my mind feels focused, and my body feels like it’s doing what it was designed to do. We also run to help others. That was the focus of our Cross-Connecticut Rail Trail Run on December 15. I was asked by MHC’s Suzi Craig earlier in the year to join the #Be1of110 fund-raising campaign sponsored by Mental Health Connecticut to help raise $110,000 in honor of their 110th anniversary. The campaign emphasized stories of how people maintained their own mental health and balance. Which is another reason why I run: It provides that balance in my life. It’s the third leg of my “stool” – the other two being my family and work. I cast about for several weeks trying to decide on the right event around which to organize the fundraising campaign, ideally something I hadn’t done before but suitably epic to make it a worthwhile adventure and a rallying cry for my friends and family. I decided I’d run across the state on Connecticut’s rail trail system, starting at the Massachusetts border in Southwick and running south for 56 miles all the way to New Haven and the Long Island Sound. I think many ultrarunners dream of running across their state from border to border. Since Connecticut is one of the smallest states, it seemed appropriate to take advantage of this. I reached out in the fall to Brian Roccapriore and Andrew Orefice, who had done this route the previous year. Turns out Andrew was planning to run it again with a couple of people, including Becky Burke and David Ross. Thus two activities became one – we decided to combine forces, and committed to Mental Health Connecticut as the cause. We were joined by Jim McCusker, and we had our team. During the week and a half leading up to run morning, the forecast was dreadful. We’d had two weeks of clear, cold, dry weather. Our forecast called for steady rain overnight into Saturday, breaking that dry spell and foretelling a wet day. I wasn’t looking forward to it, but realized it was out of my control. Lo and behold, a day before our run, the forecast improved: the chance of rain dropped into the single digits, and the temps promised to warm up into the 40s under overcast skies – arguably perfect running conditions. After waking up at 3:00 Saturday morning, I made my way to Long Wharf in New Haven, where I met Andrew, Becky, David, and Jim. Andrew had decided to act as our crew rather than run to avoid aggravating an injury. His services proved invaluable, as he toted his Prius full of our smelly gear and all types of drinks and munchies the whole time. He was the reason we had such a good day. As we drove north on 91 from New Haven to the Connecticut-Massachusetts border, it was hard not to feel a little nervous. Boy, that’s a lot of driving, I thought. And we’re trying to cover all that on foot today. But my excitement overpowered my nerves – as was the reminder that we were running this to help people who are struggling with mental health challenges. When you’re running for something other than yourself, you find wellsprings of inspiration and power that you might not otherwise tap. We arrived – in the dark, in the fog – at a small parking lot in Southwick. We geared up, flicked on our headlamps, and paused for a picture at the border sign. The start of our adventure. We hugged Andrew, confirmed our first rendezvous spot, and – just as with every other run – took our first step on the trail to begin our adventure. It was chilly enough for us to have on long sleeves, gloves, and even a jacket or two. As we began moving, we warmed up. And after about half an hour, we flicked off our headlamps, letting the brightening gray morning skies guide our way. An interesting feature of the rail trail: At some spots, you can look ahead and only see the trail through a tunnel of trees tapering to a point into the distance. It reminded me of those drawing exercises in middle school art class that taught us about perspective. Our destination was the point in the exact middle. 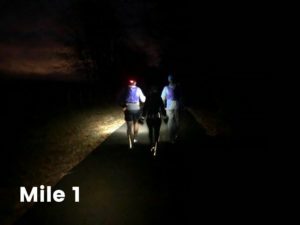 We couldn’t see the end – it kept moving ahead of us, ever out of reach, a running will-o-the-wisp – but our hopes were that at some point later today, we’d catch up. We came across the sign telling us we were entering Simsbury. We began a routine here: Pausing for each of the border signs showing we entered a new town. It was a fun way to mark our progress. At Iron Horse Boulevard in Simsbury we met Andrew for our first planned aid station about ten miles in. We began a second routine here: Greeting Andrew. Refilling our hydration vests and bottles. Finding a bathroom if one was nearby (or finding a tree or boulder if one was not). And partaking of the hundreds of calories we’d need to get us throughout the day. For most of the run I got through on a nice variety of food and drink: Tailwind, water, toasted marshmallow Gu gels, these incredible roasted and salted sweet potatoes that Andrew had made the day before, Pepsi, and chips. We bid farewell to Andrew and continued on our way. I was familiar with this portion of the rail trail, having run it many times with the Sole Sisters and other friends over the years. We even passed the offices of Chubb, where I worked in my first job after college. I ran on the same trail that I had run hundreds of times during my lunch breaks while at Chubb, and (I confess) got a little nostalgic. 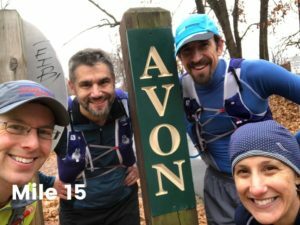 At mile 15 we entered Avon, where the rail trail took a jaunt through a mile or two of roads through some corporate parks, medical buildings, and the Avon police department. As the day continued, we began to see more people on the trail: Runners, dog walkers, moms and dads pushing baby strollers. It felt good to be part of this unique rail trail community, all of us sharing the path. At one point, a runner decked out in a red jacket began waving as she approached us. Surprise: It was Reagan Harris Fitzgibbons, meeting us for a segment of the run. And a few minutes later, I saw a trio of runners close behind. I had run hundreds of miles with them over the years, and recognized their strides even from afar: Wanda Hodsen, Karen Prado, and David Hoople. They met up with us; we all hugged; and our foursome swelled to eight. Do you know how good it feels to have friends surprise you in the middle of a long run? A really long run? It’s like a shot of adrenaline. The pain vanishes, and your heart and mind are distracted with happiness, at least temporarily. Friends can act as endorphins. Sounds corny but it’s true. We had an absolute blast in the next few miles leaving Avon, entering Farmington, and meeting up with Andrew on the trail, who was waiting for us with our second aid station stop. We all replenished, climbed back up the hill to the trail, and continued on our way. 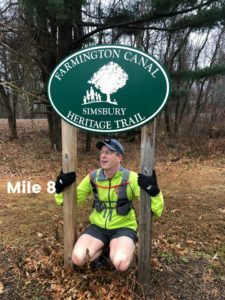 Farmington became Plainville at mile 25, and with that transition a slight twinge of anxiety. After Plainville, the rail trail proper ends for a few miles, and we’d need to run on busy Route 10 through southern Plainville and northern Southington before picking up the trail again near downtown Southington. We weren’t looking forward to that segment, but after bidding farewell to our friends (who turned around at the end of the trail in Plainville), we dove in headfirst. It wasn’t as bad as we thought. We actually had a couple miles of sidewalk. Where there wasn’t sidewalk, we ran on the grass. At this point, I paused to assess how I was feeling. The early 20’s are usually the hardest part of a long ultra for me. It’s almost like it takes that long to “warm up”. But I knew what to expect: The pain and stiffness most likely would reach a certain point, as they usually do, but not get any worse. And sure enough, I felt pretty good through these miles, emerging on the other side confident in the rest of the day ahead. 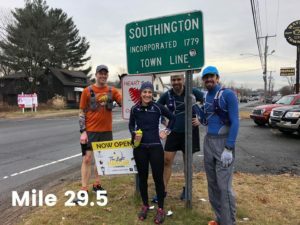 At mile 29.5 we crossed into my hometown of Southington. It wasn’t a pretty entrance, as we were running on the less-than-glamorous section of Route 10 with strip malls and gas stations on either side. But it still felt nice to run through “home” and know exactly where we were going. We spied Andrew at our third aid station. With him were two friends who put a huge smile on my face: Blair Balchunas and Brian Lachance, who kindly decided to show up and cheer us on. Thank you both! 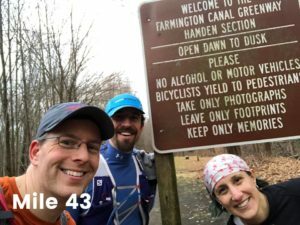 We left the aid station and regained the trailhead off Lazy Lane in Southington. This was VERY familiar territory for me, as I run this portion most weekday mornings. I bored Becky, David and Jim with my hometown stories: “Here’s where I usually turn around for my morning runs! Here’s the mural the girl scouts painted! Here’s the restaurant where Sara Murdock Lo Presti and I like to visit for flights of beer and trivial pursuit!” They were all very patient with me. I fully confess that I was looking forward to stopping at one of the Southington breweries. Kinsmen worked out better for our pace and schedule. We walked in – smelly, stiff, and scruffy – and enjoyed a beer compliments of Andrew. (Did I mention he’s awesome?) It was delicious and cold. 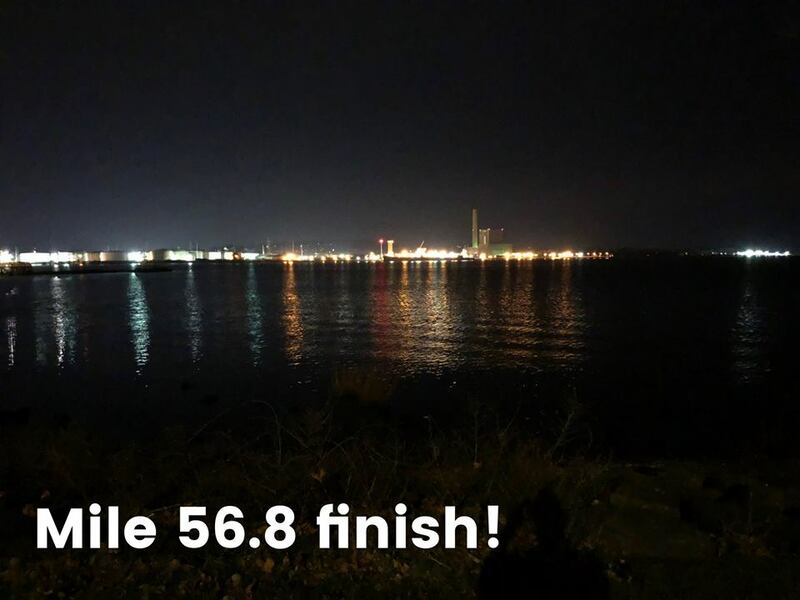 Even though Kinsman was mile 35.5 in our 56-mile run, for me it was the mental halfway point. At Kinsman, Jim decided to shift to crewing for us. He had an awesome day and set a distance PR for himself. He joined Andrew as Becky, David and I left the brewery and continued on our way. One of the magical things about running long distances with other people is the amazing scope of topics you cover in conversation. You literally have all day together, so you better be ready to talk. And talk we did about everything under the sun: friends, family, relationships, food, running, college, career, footwear, music (Becky has awesome taste in music, including 80’s new wave), you name it. Peppered throughout, we checked on each other to see how we were feeling and doing. We laughed a lot. Southington became Cheshire, which featured historical plaques along the trail providing history lessons of the railroad and canal that once operated where we were now running. And in popped local runner Jeff Grant, who joined us for several miles into Hamden. Just like before, it was refreshing having someone new run with us and take our minds off the miles ahead. But those miles were becoming shorter. At one point we talked about whether or not we could feel the excitement yet of the approaching end. I felt it a little, but at mile 44 with a half-marathon still to go, it wasn’t overpowering. Not quite yet. Jeff left and we met up with Andy again at mile 45. Dusk was beginning to fall, but as we were still on the trail for several miles, we decided to wait on our headlamps. I contemplated throwing a jacket on, but Jim pointed out it was still pretty warm – we were just cold when we stopped moving. He was right, so I kept with my current wardrobe of shorts, arm sleeves, and gloves. At the mile 50 (or so) aid station, we were met by David’s family, complete with a “Run Daddy!” sign. It was awesome! Andrew also surprised us with tacos from Taco Bell – which made me laugh out loud, following the Taco Trial from just a week ago. But dang warm food tasted good at 5:30 in the evening after a full day of running. And at long last: We entered New Haven, mile 52. It was our last town on our rail trail journey. Now we could all feel the end, and were getting excited. Our headlamps danced on the lights of cars as we crossed the many side streets that intersected this section of the rail trail. The first couple of miles in New Haven felt pretty dicey – Becky had her pepper spray just in case! – but we kept moving forward. Dicey New Haven suddenly became cool New Haven as we entered the campus of Yale University. David was deeply familiar with the area, and we enjoyed his stories about the revitalization of this part of the city under Yale’s leadership. It was at Yale that we came upon the literal end of the rail trail around mile 54.5. It stopped at a gate underneath a road. We could have gone through the gate, but the tunnel beyond appeared to end at another gate. We had run as much of the trail as was possible. It felt really good. We walked up and around, and with David serving as our guide, we made our way through the streets of New Haven. And even though I couldn’t actually smell the water, I knew Long Island Sound – the end of our adventure – was drawing near. Past a Subway. Past Union Station. Past dumpsters and highways and street lights. Around a corner. Onto another walking path. And finally, there it was: Through cloudy skies, the city lights twinkled on the gently lapping water of the small harbor in New haven that opened to the Sound. David, Becky and I ran the last few hundred feet like we were at the start of a 5k, like we hadn’t just run on tired feet for more than twelve hours. Not necessarily fast, but light, free, and easy. We reached the parking lot, touched our cars, and let the simple yet deep pleasure of a mission accomplished wash over us. The water served as our soundtrack as we sat down in the dirty parking lot of Long Wharf to dig into tofu dumplings and soy sauce that David’s wife had so kindly found for us. Andrew surprised us with a finisher’s award: A homemade brew that he said still needs to sit for a week before refrigerating. I loved it. After a few final pictures, we said our farewells with grimy hugs and fist-bumps. I thanked everyone for joining in to champion Mental Health Connecticut, which would be benefitting from nearly $2,000 through our campaign. I am deeply grateful for everyone who made a donation. I climbed into my car and texted Sara that I was heading home. On my drive home, I reflected back on our journey. It’s not every day you get to run across your state from one border to another. Yet we had done just that. Our tribe had come together to be part of something bigger than each person individually. We had helped each other, fed each other, drank with each other, and carried each other’s gear. We had laughed and cried (at least, I cried), joked and swore, shouted and cheered. And while we all had a blast doing what we love, we had also done it for others. So is running a selfish sport? Partly so. But through running, I’ve seen people rise above their limits, discover deep wells of strength and kindness, unite to help our communities, and bring each other together to make our world better. I can’t find that definition of “selfish” in my dictionary.